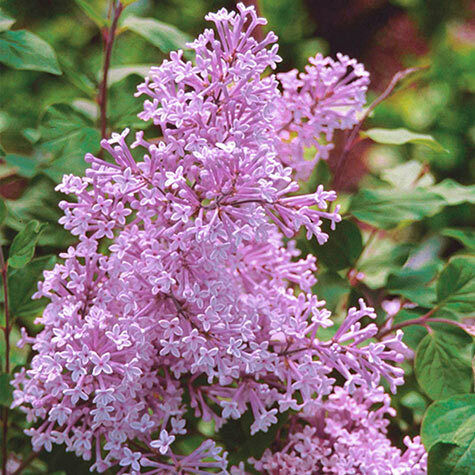 Josee Reblooming Lilac | Gurney's Seed & Nursery Co. This hardy lilac loves the sun and is just the right size (at 4-6 ft. tall) as an accent shrub or grouped as a hedgerow. Fragrant, lavender-pink panicles of trumpet-shaped flowers are 4-5 in. long and can't be beat as cut flowers. Even butterflies can't resist this lilac. Potted. Zones 2-9. Comments: A dwarf lilac noted for it.s ability to bloom continuously until frost. Josee is the result of a 3-way cross between S. meyeri, S. patula, and S. microphylla. A hardy lilac that is just the right size for a specimen planting or hedge row.